The compact crossover starts at at $39,595. After months of testing – some of which we caught in spy photos – and a little teasing, Jaguar has officially entered the compact crossover space with the launch of the 2018 E-Pace. And it was a fairly grand entry, too. 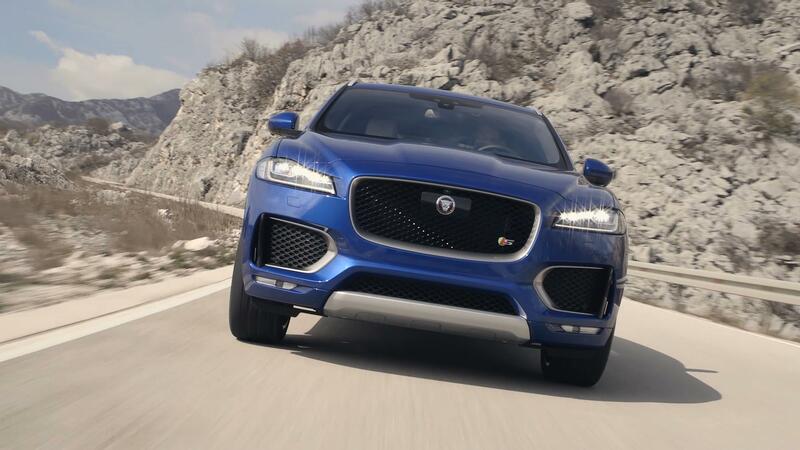 Instead of the usual move of driving the car onto the stage or pulling off the sheet, Jaguar did a barrel roll in the E-Pace to hail its coming. Yes, Jaguar did a 270-degree corkscrew jump with the E-Pace, launching it 50 feet through the air to earn it a Guinness World Record for the "Furthest Barrel Roll in a Production Vehicle." It's similar to the stunt the automaker pulled for the launch of the F-Pace, which entered the world with a record-setting loop. The Jaguar E-Pace is smaller than the F-Pace, and seats five. It's available with a pair of 2.0-liter turbocharged inline-four gasoline engines mated to a nine-speed automatic transmission. The base motor makes 246 horsepower and 269 pound-feet of torque, and puts that power to the ground via a standard all-wheel-drive system. The R-Dynamic version ups the output figures to 296 horsepower and 295 pound-feet, comes with a pair of paddle shifters, and gets the Active Driveline AWD system. Both drivelines can transfer almost all the torque to either the front or rear axles, depending on the driving situation, but the Advanced Driveline can disengage AWD, sending power to just the front axle to save fuel, and does more to keep the car stable in dynamic driving. The E-Pace also offers an optional Configurable Dynamics package that allows the driver to select Normal or Dynamic modes, which affect throttle, transmission, and steering response. The optional Adaptive Dynamics system provides variable suspension damping based on the driving mode. Drivers can select driving modes through the E-Pace's JaguarDrive control, choosing from Normal, Dynamic, Eco, as well as a Rain, Ice and Snow mode for low-grip conditions. Inside the car, the E-Pace is equipped with a 10-inch touchscreen infotainment system that has a customizable home screen. Two premium Meridian audio systems and a head-up display are available. All models have a feature that allows the owner to check on the vehicle remotely. The E-Pace also offers 4G Wi-Fi, and a connected navigation system that offers real time traffic and parking information. The E-Pace starts at $39,595. The R-Dynamic version begins at $48,245. Jaguar will also offer a limited E-Pace First Edition at a price of $54,545. IHS Market principal automotive analyst Ian Fletcher makes a few predictions about E-Pace sales. Fletcher believe that sales will peak at about 61,500 units in 2019 out of a predicted overall volume of 270,800 units for Jaguar. That's up from 147,300 units in 2016. IHS Markit predicts 765,700 total sales for Jaguar Land Rover in 2019, up from 589,200 units in 2016. As for that barrel roll, it required 525 feet of run-up and run-off, as well as months of preparation, including CAD modeling for the ramps. Stunt driver Terry Grant experienced 5.5 Gs during the jump. "As far as I am aware, no production car has ever cleanly completed a bona-fide barrel roll," Grant said, "and therefore it has always been an ambition of mine to perform one ever since I was a boy."